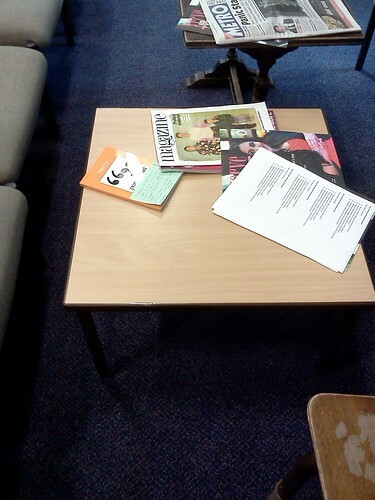 Posted by IaninSheffield in Inspiration, Reading, Teaching Idea. 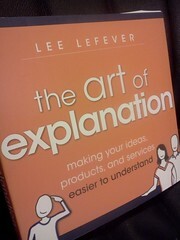 As I mentioned in a previous post, I recently acquired the book “The Art of Explanation” by Lee LeFever. Impressed by the clarity and economy of explanation in CommonCraft videos, I wondered what lessons there might be for those of us who work in the classroom. I guess the first step is to isolate that part of our teaching and learning environments to which ‘The Art …’ applies and here the early chapters provide a signpost. Specifically the book is about explanations, so defining the term makes sense and for Lee explanation is about making facts more understandable; about ‘lowering the cost of figuring out an idea and inviting people to become customers of it in the future.’ Explanations help people beyond the ‘how’ questions through to the ‘why’ to the point where they are sufficiently confident and care enough to want to find out more for themselves. With teachers I’m sure that will have a certain resonance. We’ve all at some time or another looked out over a sea of blank stares, a time when our attempt at explanation was … less than optimal! Lee provides some pointers here and argues that it all begins with confidence; when someone loses confidence that they can grasp the idea that you’re communicating, you’ve lost them. One problem which might lead to this is making assumptions about that level of confidence when working with a group. One-on-one, it’s easier to spot the tell-tale signs when you’re losing someone; with thirty (or more), that’s much tougher and can lead to false assumptions. One cause is the curse of knowledge, that we as ‘experts’ in our fields sometimes suffer from, where we misplace our ability to see the world from another person’s perspective. Again as experts, we’re sometimes guilty of using terminology to which our audience (or some within it) may not be party and as a consequence they lose confidence. One more factor of crucial importance in helping someone to understanding is in setting a context with which they can relate; if an explanation is provided in splendid isolation, people are far less likely to care. Agreement – build confidence from the outset by using big-picture statements which will have resonance for all. Context – takes the points on which we can agree, to a new place; one which also lets the audience know why it should matter to them. Story – a narrative woven around a character which experiences the aforementioned journey and resulting benefits. Connections – analogies and metaphors used to support the story by connecting new ideas with something people already understand. The spices added to accentuate the flavour of a dish! Conclusion – summarises what has been learned and provides a ‘call to action’ for the audience to put that into practice. 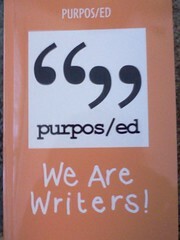 Posted by IaninSheffield in Musings, Reading, research. It’s John McLear’s fault for unsettling me over the Christmas break. It was he who suggested I ought to read Alfie Kohn’s book “Punished by Rewards” as he felt it might inform the work I was doing towards ICT Quests. The subtitle gives you a clue as to the basic premise of Kohn’s thesis – “The Trouble with Gold Stars, Incentive Plans, A’s, Praise, and Other Bribes.” In essence that much of what we do to reward, incentivise, celebrate and acknowledge the achievements of our students, actually has a detrimental effect in terms of student learning and their commitment to good values. A rewards-based system promotes extrinsic motivation or ‘Do this and you’ll get that’, the result being that much of what students do is geared towards and directed by those rewards. The question then arises’ what happens when those rewards are no longer available for whatever reason? Maybe they move into a higher year group where gold stickers are no longer appropriate, maybe they have a new teacher from whom praise is less forthcoming or they leave formal education and no longer have grade’s to strive for. Furthermore, that providing rewards has been shown to stifle creativity and problem solving capacity and discourage risk-taking. The key is doing all we can to nurture intrinsic motivation where students have a genuine interest in their endeavours, relish challenges and display greater innovativeness. We want students to want to learn, rather than wanting to be rewarded for their learning. 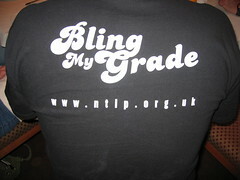 A student choosing to produce a piece of artwork and work at it out of class of his own volition or solving a maths problem she read in a newspaper because it’s challenged her thinking, is far more important than a student aiming to get an ‘A’ for a piece of coursework … or avoid getting an ‘F.’ When the grade becomes the significant element, then shortcuts are taken to achieve that grade, paths of least resistance (and lower challenge) become preferable and interesting diversions will be ignored – “Will this be on the test miss?” To get students engrossed in their learning, it is far more effective to encourage them to think about what they are doing, rather than how wellthey are doing compared with everyone else. Students will be undertaking the ICT Quests as a result of their own interest or desire, not through any element of compulsion. They will be in control; they will make the choice to opt in. They will also have choice of the level to which they wish to progress and to some degree, choice in what they produce for the output from the tasks. 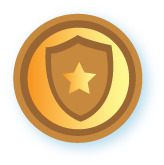 The intention is that the badges needn’t be perceived as rewards. They are more correctly seen as markers; indicators to other people of the range of skills possessed by the student displaying those badges – a ‘can-do profile’ if you will. Badges won’t be awarded with a ‘well done’ pat on the back. They are merely indicators showing that a set of criteria have been met. I think Mark Twain pretty much had it nailed when he had Tom whitewashing the fence.